Hi guys...I just got on here, and wondering how many of us are Moonies. hi there Emily. I am Erica, also known as Jupiter. I am a huge moonie. My fave senshi is Sailor Moon, how about you. I am also a huge fan of PGSM and the manga, and of course the musicals. How about you-what is your fave version of Sailor Moon? I'm a huge moonie as well! I love the original anime and PGSM. Hello, Emily. And welcome to Moon Kingdom Forums, or MKF for short. Even though there are categories on here to post on just about anything under the sun, MKF caters especially to Moonies. Thus, you should find that a large majority of us, if not all of us, are Moonies, if not huge Moonies. For example, I am certainly a Moonie. 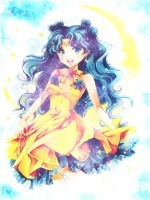 In fact, you should already be able to tell who my favorite senshi is . Would you mind telling us who your favorite senshi is, Emily? Feel free to explore the forums here, and join the conversation wherever you feel comfortable. Hey! Welcome to the boards!!! I think its safe to say that we're all moonies here! So glad to see a new face around the boards!! Hey...I'm Mike D boy from the GC and rediscovered the Moon Kingdom forums lately. I'm a fan of the Sailor Moon anthology among other animes and cartoons shows. And I discovered I'm not the oldest member, LOL. Nice to meet you, some from the GC and others I just met. Welcome back, Mike D Boy! I hope you decide to stay this time and visit often. We have lots of topics ready and waiting for you to join them! Hey there new guys! welcome the MKF! !